Yet another arusuvai ingredient arrived at my door. This time it was from Uma of Essence of Andhra. 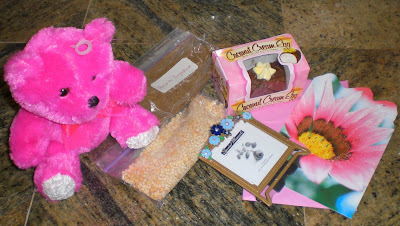 She sent me a the surprise ingredient with loads of goodies - a cuddly teddy bear, a beautiful card, a cute little photo frame, chocolate and 2 ingredients. One was urud dal and channa dal which I used it for seasoning in the chinta chiguru dal and the other one was (which I didn't guess it right) dry tamarind leaves. 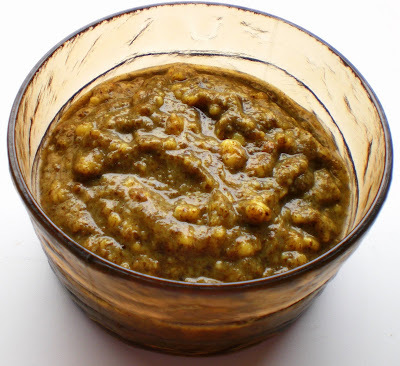 I googled for a recipe with the dry tamarind leaves and landed on Sreelu's chinta chiguru pappu. Thanks Uma for sending me all the things that I love and for sending the nellore special dry tamarind leaves. Thanks for introducing me to a new taste. Thanks to Sreelu for the wonderful recipe. We loved the dish. Wow, your daal looks great. I have never seen dry tamarind leaves!! How cool. Never tasted Tamarind Leaves... how interesting! Nice dhal, new to me. Wow, you made a good use of the dry tamarind leaves. Good job Mythreyee! Thanks for the good recipe. I am glad you've enjoyed all the goodies. oh wow! i never knew this possibility! Its new to me mythreyee..Looks Nice.